or "How I took my Mother-in-Law to a Dog Show and won Best Veteran". A big thank-you to Magdalene Hutchison, who very kindly organised the Fun Day near Lockerbie today. 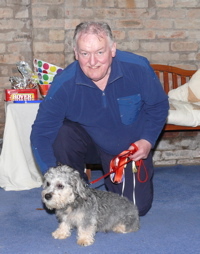 The event was well attended and it was lovely to meet so many Dandies and their owners in an informal setting. A parade of Dandies was led by a Scottish Piper. There was a delicious buffet for lunch, then John Jardine, whose father (John) and uncle (George) owned the famous Waterbeck Kennels, came to judge the opening classes of the afternoon. Best in Show was Adam MacPherson's delightful Pitfirrane Silver Melody (Dougal), at seven months old. I was accompanied by my wife, mother-in-law, and two of our Dandies, Tammy and Donald. Donald came 5th in 'Saddest Eyes', and the venerable Tammy surprised my wife and I by winning Best Veteran. 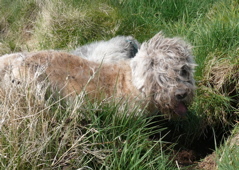 I usually try to photograph all the entrants, but as I was showing this time I was not able to do this, so here is a photograph of her the day before, having just emerged from a rabbit hole. To my wife's consternation we had not had time to clean her up before the show. 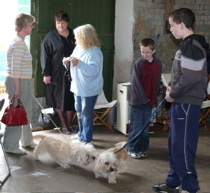 Proceeds from the Fun Day are going to support Magdalene's Dandie Rescue.